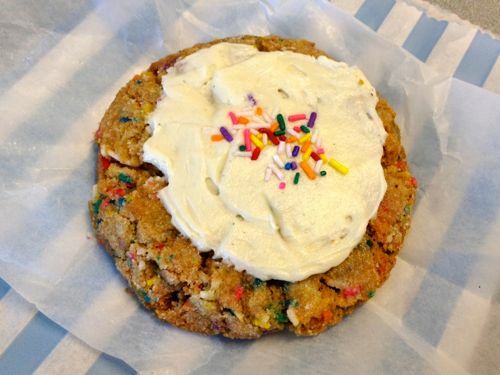 The Schmackary’s Funfetti cookie launched last month, and since then I haven’t been to the store without purchasing one. I mean, look at it, how can it not make your day at least 20% better? Rainbow sprinkles, vanilla and cream cheese frosting make up this playful-looking and deliciously sweet cookie. Really, that cream cheese frosting is the kicker. Schmackary’s, you’ve done it again! Posted by Rachel Goldner at 3:12 pm, September 26th, 2013 under Schmackary's.